Emma Gilmour, under the name “Hudsen Armidi,” has recently designed these very well done moto jackets. They come in a wide range of colors. In each color pack, you will find a jacket layer, and, in two pre-sized but moddable versions (one for men, one for women or small avatars), cuffs, collar and a bottom piece in sculpty prims. As you might notice on the following pictures, the texturing of the prim attachment is totally great. You can often find unmatching textures between clothing layers and prim attachments, but these ones are melting almost perfectly, with a level of quality I never knew ’til now. Everything is, obviously, moddable and copy-no transfer. Choose your favorite colors for 475 Lindens each! Besides the classic ones, try on the bright ones, like the luminous green I’m showing in the main composite! Showing: ! SLAB Uno Green (Black Belt), Armidi Limited - Moto Leather Jacket [Moss], [ hoorenbeek ] Air Force - Grey/Blue. Left to Right: Armidi Limited - Moto Leather Jacket [Shale w/Creme] and [Charcoal]. I needed high quality jeans to match these jackets. I chose the new UNO jeans from SLAB. I’m pretty ok with the great Robin Sojourner when she says, “jeans shouldn’t cost an arm and a leg.” But I have to admit that these jeans from Pompo Bombaci are really nicely done, and are worth it, especially since he cut their price! They come in four colors (shown below.) 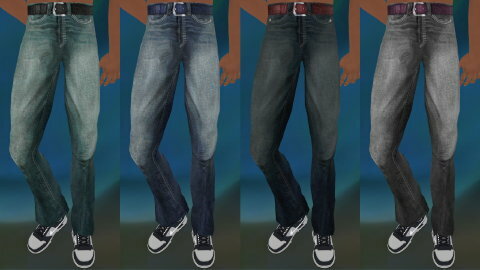 In each color pack, you will have four versions with a different belt color, on both pants and underpants layer, plus a pair of matching socks, very useful to make the inner side of those nicely textured items look as good as the outside (for newbies, inner color and texture of pants is done with the socks); I wish more designers would think of offering these kinds of goodies! Elegance hides in details, like the devil… So, you will get your color pack for 395 lindens, with 20% off the introductory price. For bargain chasers, the fat pack is now priced at 995 lindens. 12 versions of the jeans, in every color, every belt color, each of the twelve in both pants and underpants layers, plus matching socks. If you want great photosourced jeans for each and every occasion, this is the master choice! Left to Right: ! SLAB Uno Green (Black Belt), Blue (Blue Belt), Basics (Brown Belt), and Gray (Purple Belt). I’m showing also the good “Nike-like” from Hoorenbeek: Airforce. The designers behind the brand offer now a wide range of casual and dress sculpty shoes. These Airforce show quality building. They come in six colors, each of them in 4 sizes. You can choose your perms: copy or transfer, according to your needs, for 520 Lindens per color. If you want shoes that mimic RL ones, Hoorenbeek has definitely become a brand of choice. 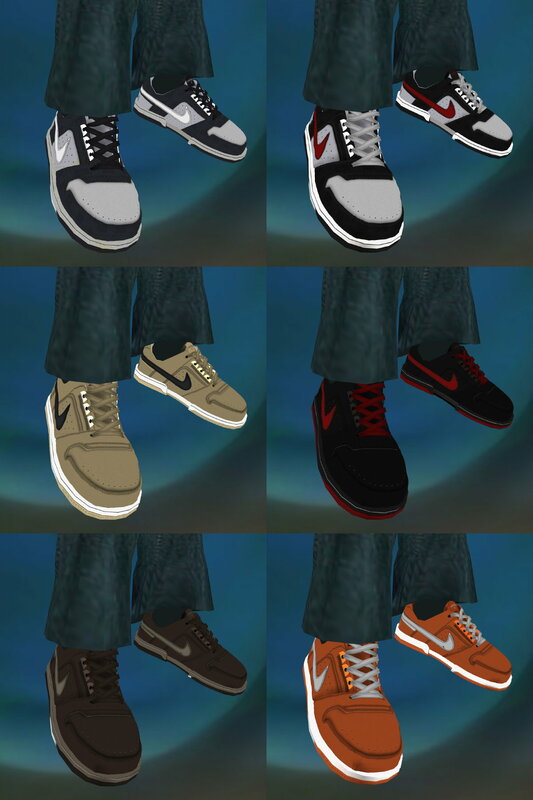 Left to Right & Top Down: [ hoorenbeek ] Air Force - Grey/Blue, Grey/Red, Beige, Black/Red, Brown, and Orange. 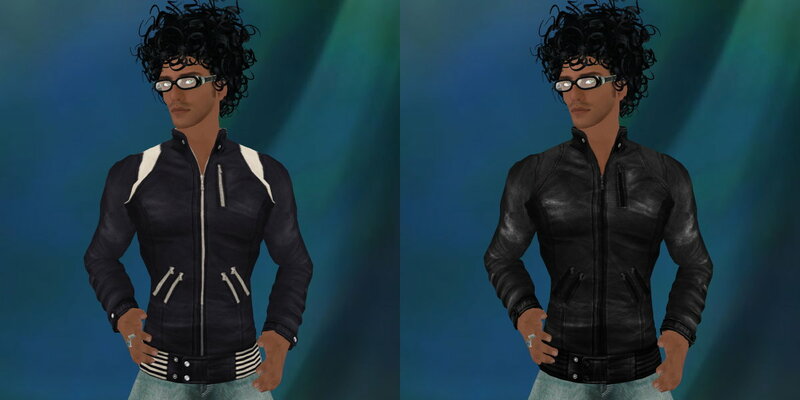 Also showing the last Ottico glasses and a new cool and funny hair from Boon: KAR07. You need it if you’re looking for middle length heavily curled hair!